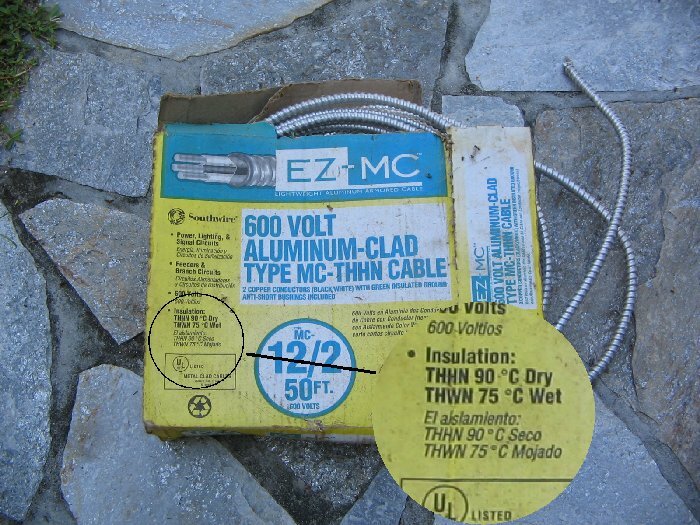 There's a type of MC cable that has a PVC jacket on top of the armor, Southwire calls it Parking Lot/Deck Cable. Special connectors must be used with it, as well. The connectors have a gland nut, much like the gland nut on a cord grip. are listed for use in wet locations, and a corrosion resistant jacket is provided over the metallic sheath. Most aluminum jacket MC is listed "wet", simply because they use a wet location conductor inside the jacket. (c) also states "and a corrosion resistant jacket is provided over the metallic sheath." Both AFC and Southwire say their aluminum armored MC is listed for "Dry use only"
This is the box I have in the garage. c. The insulated conductors under the metallic covering are listed for use in wet locations. The code Changed in 2008 it's present verbiage, and also first prohibited FMC in wet locations, too. Could it be you bought cable pre-2008? It would appear the committee is trying to stop the use of MC and Greenfield as HVAC condenser whips. In commercial work they have long been considered unacceptable. Yet you see them all over town, hereabouts, powering up HVAC condensers -- pad mounted -- residential. With this rule change, Sealtite or PVC coated MC becomes required. Since I can't point to any fire risk issues, it would appear to be a code change motivated by the NEMA players. I certainly see no issue with the cable above. The inside of a raceway is still a wet location if it is outside and THWN is a wet rated conductor. What difference does it make if the rain is getting into the MC/FMC? Is it any wetter than a buried raceway is filled with water? There's never really been an issue with MC itself in a wet / outdoor location. You're doing just fine until you get to the end of the cable. Why? Because every MC connector I've ever seen has been marked as for 'dry locations only.' There's the problem. Were it not for the price of the (weather-tight) fittings, I suspect we'd see a lot of UF used as HVAC whips. As I learned the trade, the only material considered for such whips was metal-lined "Sealtite." I will admit that there is still a role that only such a method can meet. Yet, I wonder if we're trying too hard to be 'perfect?' For the applications we're discussing, we're using "normal" 20- or 30-amp 120 power. Even the use of 240 in residential air conditioning is becoming rare. It seems a natural application for a less elaborate method - even (gasp!) a cord and plug. They do let you glue up ENT.